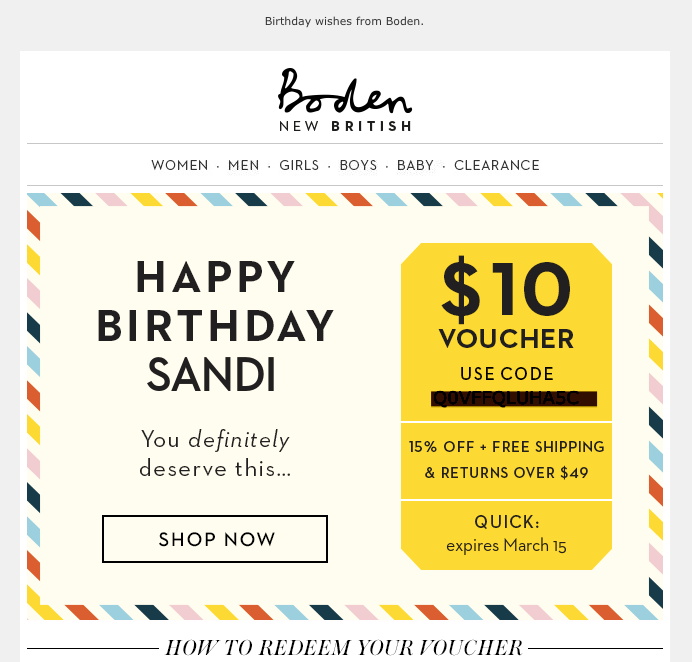 Birthday emails should be a part of every brand’s email marketing program because they work. How effective are they? According to Experian, birthday emails achieve far higher transaction rates (481 percent) and revenue (342 percent) than regular promotional emails. My birthday is in February, so last month I received quite a few birthday emails. Using the messages I received, I’m going to highlight examples of what to do to make the most of this unique marketing opportunity. A good birthday email is timely, relevant and actionable. While the same could be said for a good promotional email, a birthday email has the opportunity to be highly unique and personalized. Of the 20 messages I received, all but three used “birthday” or “Happy Birthday” in the subject line. Also, only four used my name in the subject line. The “winner” in this category would be Boden, which used “Today is YOUR day” as the subject line for a message it sent on my birthday. In case there was any uncertainty as to what type of message it was, the preheader included text I could see in my preview pane that made sure I’d know the message contained a birthday offer. Only two companies – Boden and Mellow Mushroom – bothered to send a follow-up note to remind me of my birthday offer. This is a HUGE missed opportunity. With what may be an uptick in messages in their inbox, may forget about a brand’s special birthday offer. According to Experian, reminder emails generate rate increases of at least 20 percent in open, click-to-delivered, average order value and revenue per email when compared to the original birthday email sent. Birthday offers received range from a free drink (from Starbucks) to a discount off a purchase ($5 off from DSW and Magazines.com, $10 off from Boden and 20% off fab’rik clothing). I also got free food from IHOP, Ted’s Montana Grill and The Counter. Only the Counter didn’t give instructions for how to redeem the offer. The rest included a code or a note to show the email in-store. I began to receive offers on the first day of my birthday month, all the way up through my actual birthday. Eight of the 20 came on my birthday. The loser of the bunch was Starbucks, which only gave me three days to redeem the offer. The rest ranged from two weeks to a just over a month in which to redeem the offer. It was timely (arrived on my birthday and 12 days later), relevant (I love their clothes) and actionable (I had more than a month to redeem the gift code).